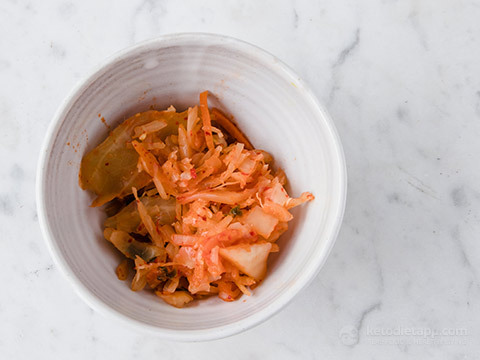 Kimchi is all the rage right now and for good reason, it’s so good for your gut health. 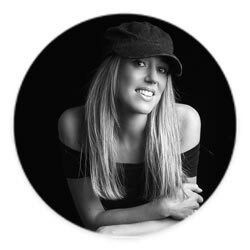 It’s really important that we look after our guts and keep the healthy bacteria in check. Having a happy gut and super strong gut lining is the key to improved health. 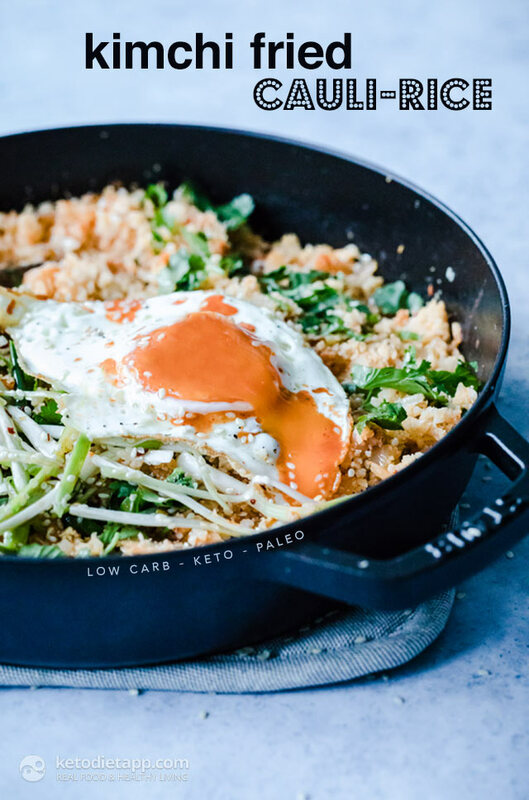 If you love it then you have to try this cauliflower rice recipe. Packed so full of flavour, your tastebuds will be tango’ing that’s for sure! Optionally, you can swap the eggs for your favourite side of protein. I love it with crispy chicken thighs or a piece of roast salmon. Speedy and tasty, it’s one you’ll make time and time again. Looking for more similar recipes? 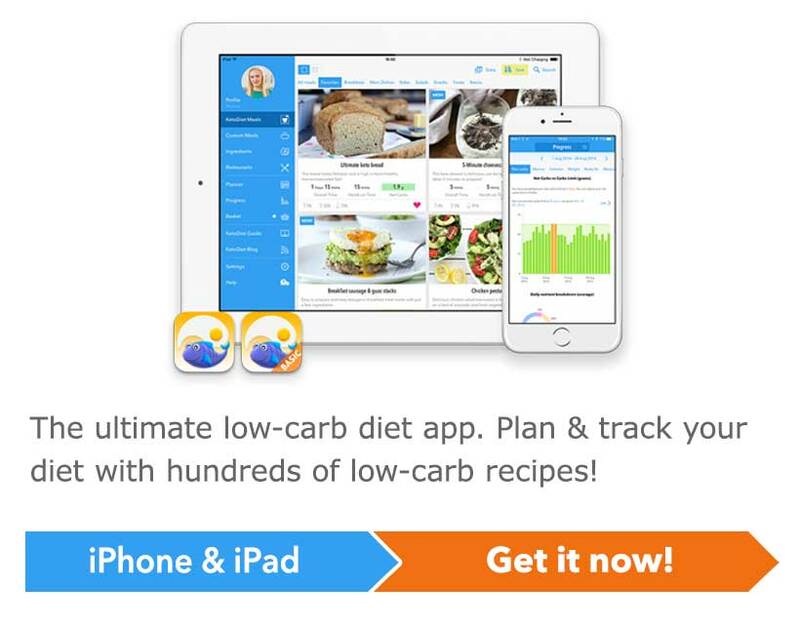 Make sure to check out our gut-healthy keto recipes! Note: You can find a homemade kimchi recipe in the Quick Keto Book. If you are following a vegetarian keto diet, keep in mind that kimchi typically contains fish sauce but you can find many vegetarian or vegan products that exclude it. First, prepare the topper. Finely slice the spring onions. Mix with the dressing and place to one side. 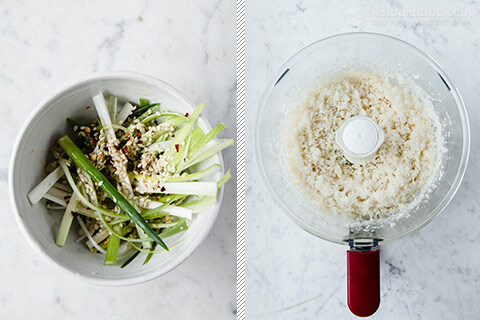 Place the cauliflower florets in a high speed food processor and pulse until they resemble a rice consistency. Microwave for 5 minutes (or steam for 8 - 10 minutes until soft). 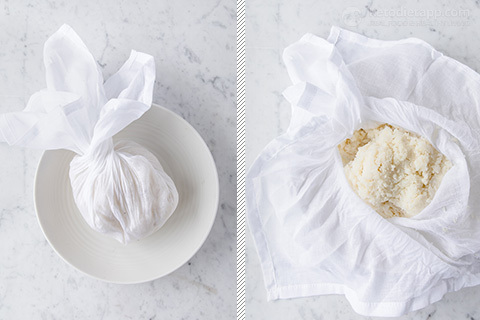 Allow to cool then transfer to a muslin cloth and squeeze out the excess water. This is my top tip to get super fluffy cauliflower rice! Note: Alternatively, simply add the raw cauli-rice in step 6 before the kimchi) and pan-fry uncovered for 5-7 minutes. Drain the kimchi, but keep the juice to one side. Heat the ghee or coconut oil in a non stick or cast iron pan. Add the onion and fry on a medium-low heat for 1 - 2 minutes until soften. Add the garlic and ginger and fry for another 30 seconds. Add the kimchi for another 1 - 2 minutes until sticky. Next, add the cauliflower rice to the kimchi mix and the juice. Turn off the heat. Stir through the coconut aminos. Add the lime juice and season with salt and pepper to taste. Heat 1 tbsp of ghee or coconut oil in a non stick frying pan. Fry the eggs to your liking. 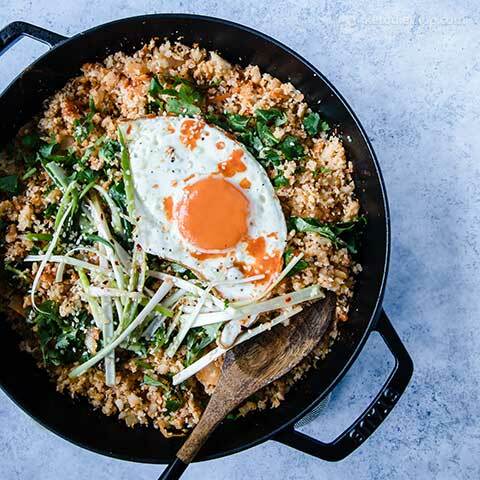 Top the kimchi fried cauli-rice with fried eggs, spring onions and sriracha sauce. Drizzle with olive oil. Eat immediately. 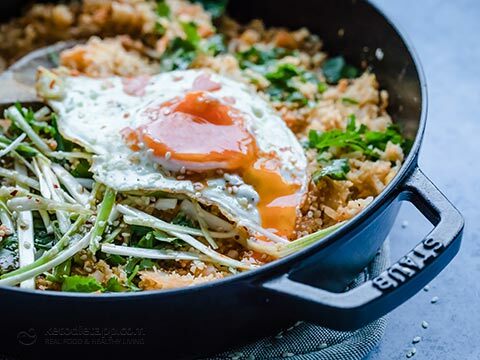 The kimchi fried cauli-rice (without the fried egg) can be stored in the fridge for up to 4 days, and can be reheated or eaten cold. Fried eggs are best prepared just before serving. That egg yolk looks so yummy! I can't wait to try this!